God designed life-sustaining mechanisms for all His creatures—even the slowest moving—but we humans have off-this-planet-alive insurance! Sloths are mammals who move slowly, negotiating trees "hand over hand" to move along in the branches with fore limbs that have two or three "finger hooked claws—depending on whether they are in the family of a two-toed or three-toed species. The two-toed variety is a trifle larger than the three-toed. They have a longer nose, longer hair and move just a bit faster than three-toed sloths who do have short tails. But all sloths have three toes with long claws at the end of their back limbs. The Creator gave all these tree-dwelling sloths a not-by-accident ability to live successfully up to thirty years hanging upside down from tree rainforests of Central and South America. And live they can! That includes eating, sleeping, mating, giving birth and even dying—all while hanging upside down! And their not-by-accident design includes having their hair grow longest away from their extremities, since that is where more protection is needed, due to the position in which they spend most of their lives. (That’s totally unique to them, among mammals, by the way.) But their Maker did design them to make a not-by-accident trip slowly once a week—down to the ground at the bottom of the tree where they live—to urinate and to defecate—digging a hole and covering it afterwards. Two logical reasons account for just one weekly trip—and there are no doubt more the Creator knows and will tell us about later when we're together with Him in person! For now, first: Sloths have very slow metabolism—with several stomach compartments holding bacteria where some of their diet of leaves and twigs and otherwise indigestible material that carries little nutrition not by accident can be broken down into digestible matter for these little animals. But that food processing can take up to an entire month going through all those compartments so there's no hurry to evacuate! (EVERYTHING is slow!) Another important not-by-accident reason why the Creator made sure they didn't need to go to the ground often is because on the ground they are so vulnerable to predators. Other than the momentary protection of a vicious claw slash at an attacker—they have no ground speed to "run" away, as their fastest speed might be likened to the movements of the slowest little flower girl you've seen wander down the aisle at a wedding! But sloths have been given a most unique protection device by their Creator as they hang upside down from a tree branch. It's a color camouflage! Not by accident, green algae find just the home it needs in the hollow hairs of a sloth. And green algae mixed with the grey-brown hair of the sloth that just barely moves all day makes them next to impossible for a predator like a jaguar to detect. In fact, when sleeping, they tuck their head between their front arms, bring all their legs together as close as possible, and hang there ever so still looking like a grey-green ball that is part of the tree! 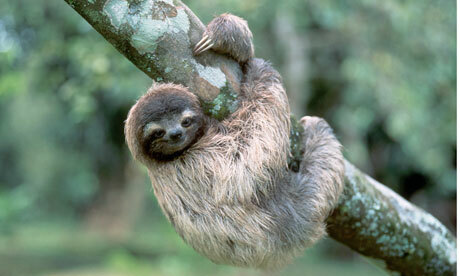 But their slow movements bless other creatures from beetles to moths who make their homes in a sloth’s hair. Never underestimate God's not-by-accident planning. The "sloth moth" lives in that hair, and feeds on the algae. Then, when the sloth needs to "go potty” that “sloth moth” - at that right moment in its life cycle - takes the trip down to the ground, crawls out of the hair, and deposits its eggs in the feces the sloth left behind. The sloth has just enabled the sloth moth's eggs to pupate and hatch—after which they will fly off to find their own sloth to make a home. Meanwhile our sloth, finished with its "business” climbs back up, again attaching its four paws onto a branch, and resumes hanging among the leaves, with its big eyes searching for fruit etc. There is nothing that indicates reason to hurry to a sloth sloth—since their diet provides little energy. So God programmed the furry sloth's slow movements—for his own protection. It's His plan for them. We humans get to choose our Creator/Savior's plan for us or not! And ours includes inner peace now and out-of-this-world protection!